AS of today, almost 25 BILLION (Yes, billion with a B) have been downloaded from the Apple App Store. The current number of apps that have been downloaded (as of the publication of this article) is about 24,525,000,000. Apple is hosting a contest to see who will be the winner to download the 25 billionth app. If you happen to be the lucky winner, you could win a $10,000 (USD) gift card to the Apple App store. So what are you waiting for, go ahead and start downloading some apps, you might be the winner. You may also view official rules, and enter to win without purchase at their official website. 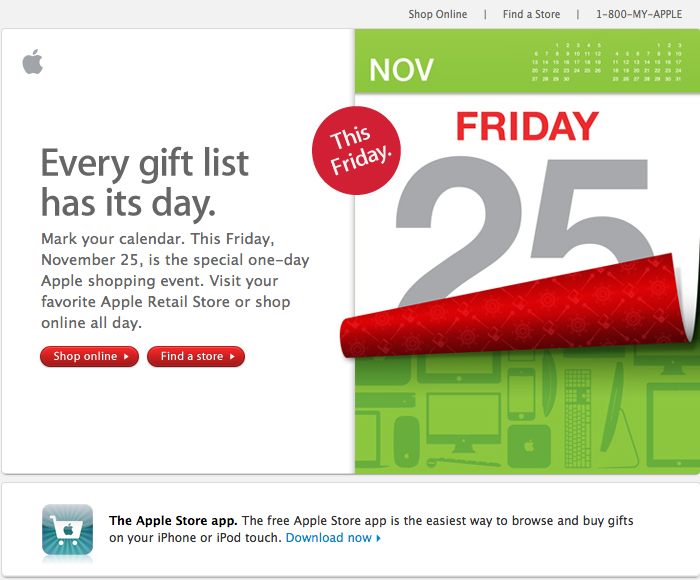 APPLE is having an online BLack Friday Sale. Apple has made this public through email notifications, and it is on the home page of their website, as well as their Apple Store app. They have not released any details. Simply, it says just to check back in on the 25th or the day after Thanksgiving. Below is a screen capture of what their email looked like. APPLE has updated their Steve Jobs page on their site to reflect many memories, thoughts and feelings that people have submitted about Steve Jobs since his passing. Apple reports that over a million people have already shared their thoughts, and more are being sent every day. Steve Jobs has seen an outpouring of support and tributes since his passing on October 5th. Apple Stores around the world have turned into makeshift memorials as fans have left flowers and notes in his memory. Jobs was 56 years old, and had been struggling with complications related to pancreatic cancer over the past several years. Apple will be holding a private company wide celebration of Steve Jobs’ life on Wednesday, October 19th. The event will take place on Apple’s campus in Cupertino. Apple Retail stores will be closed for several hours during the event so that employees may view a live webcast of the service. 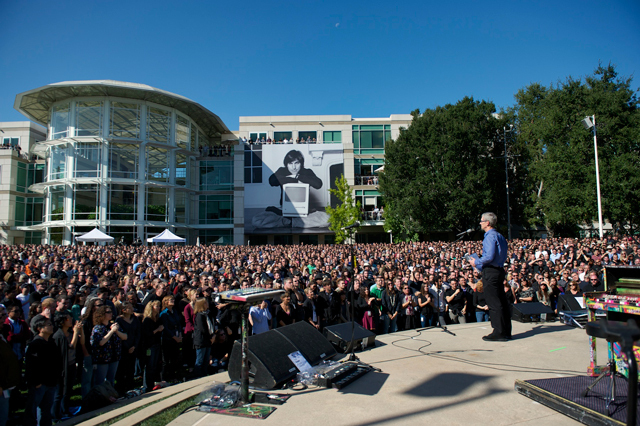 CUPERTINO, California — October 19, 2011 — Apple CEO Tim Cook speaks to employees at a celebration of Steve Jobs’ life. WHAT once was there now is gone. Earlier today, Google Voice was just two clicks away in the iOS App Store. Now, all that remains is a page cache,and versions of the app that were already installed on iPhones and iPod touches. Vincent Paquet, Senior Product Manager for Google Voice confirmed that the app had been pulled, explaining “our last update of this week had a bug that caused the app to crash at sign in. We removed it so it did not affect additional users until the fix gets published.” We’ve been using the most recent version — 1.3.0.1771 — on an iPhone 4 running iOS 5 without issue, but recent reviews cite the reported crashing, so it’s definitely affecting at least some users. We don’t have an ETA for when you can expect the app to return, so if you don’t already have it installed, you’ll need to hang tight for the time being. The service should function normally otherwise, assuming your phone number has already been registered, though you won’t be able to begin new text threads or make outgoing calls using your Google Voice number.